Now in its 10th edition, Dutch: An Essential Grammar is a reference guide to the most important aspects of modern Dutch as it is used by native speakers. Full use of examples given throughout illustrating modern usage. 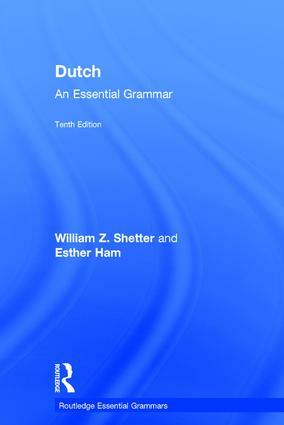 Dutch: An Essential Grammar is the ideal reference source both for those studying Dutch independently and for students in colleges, universities and adult classes. William Z. Shetter is Professor Emeritus at Indiana University, U.S.A. He has been an author for Dutch: An Essential Grammar since its first publication and is also author of The Netherlands in Perspective: The Dutch Way of Organizing a Society and its Setting (2nd edition 2002). Esther Ham is a senior lecturer and director of the Dutch Program at Indiana University, U.S.A. She is Director of Online Education for all foreign languages for the university Center for Language Excellence. Her previous publications include the basic language method books, Help: Kunt U mij even helpen? (2001), books 1 and 2. Essential Grammars describe clearly and succinctly the core rules of each language and are up-to-date and practical reference guides to the most important aspects of languages used by contemporary native speakers. They are designed for elementary to intermediate learners and present an accessible description of the language, focusing on the real patterns of use today. Essential Grammars are a reference source for the learner and user of the language, irrespective of level, setting out the complexities of the language in short, readable sections that are clear and free from jargon. Essential Grammars are ideal either for independent study or for students in schools, colleges, universities and adult classes of all types. All Essential Grammars are available as inspection copies.